The temples of Angkor are in constant need of maintenance and care. Having been exposed over a period of hundreds of years to adverse environmental conditions of extreme heat and immense seasonal rainfall their structure and, even more importantly, delicate decorations are at severe risk of complete disintegration. Due to the nature of the weathering processes involved in the deterioration of natural stone and brick, the decay mechanisms present at all Angkorian temples are accelerating at an ever-increasing pace and are now threatening the integrity of this extraordinary World Heritage Site and key tourist destination in the Kingdom. 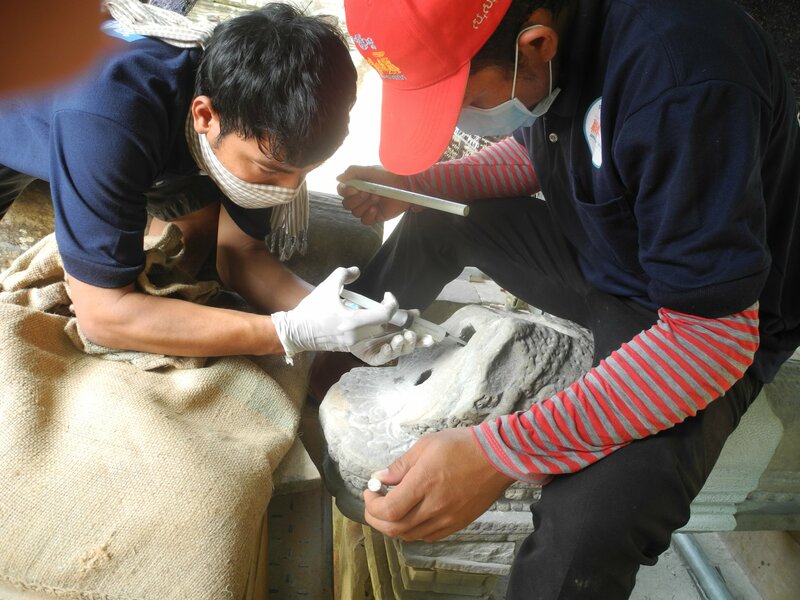 In order to enable local technicians to competently conserve these fascinating monuments and to curb further deterioration as much as possible, an organisational structure has been established within the Department of Conservation of the APSARA Authority which allows the three local senior experts to operate an effective restoration programme on behalf of the Authority and conduct vocational training schemes for a future generation of professional Cambodian stone conservators with the help of GIZ. In 2012 a comprehensive training handbook, designed specifically to suit the conservation needs of Angkor has been published bilingually in the Khmer and English languages to provide a detailed and reliable source for students, future junior conservators and trainers alike. Meanwhile, this book has been endorsed by ICCROM, an advisory body to UNESCO, as an example of best practice in the field of conservation for developing countries. Based on the contents of this work of reference a two-yearlong training curriculum has been devised which features classroom lectures as well as practical tuition directly on worksites. With the three local stone conservation experts acting as the main tutors, a first vocational training course involving 20 young Cambodian trainees has been successfully conducted between March 2013 and March 2015 after which all graduated participants have been taken into full time employment by the APSARA Authority because of the tremendous achievements of all participants. 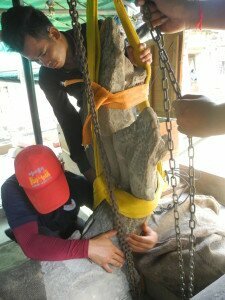 The team of currently 19 Cambodian stone conservators is, ever since, fully engaged in continuous conservation efforts on the temples of Angkor while frequently receiving advanced training in specifically identified areas to boost their skills and develop existing competencies even further. Since its inception a decade ago, more than 60 conservation projects of various sizes have been successfully concluded by the SCU on more than 25 different temple sites throughout the Angkor Park and beyond. Furthermore, the expertise of the unit is a valuable asset to the Authority, which is regularly requested from stakeholders involved in conservation and restoration activities in the Angkor Park. 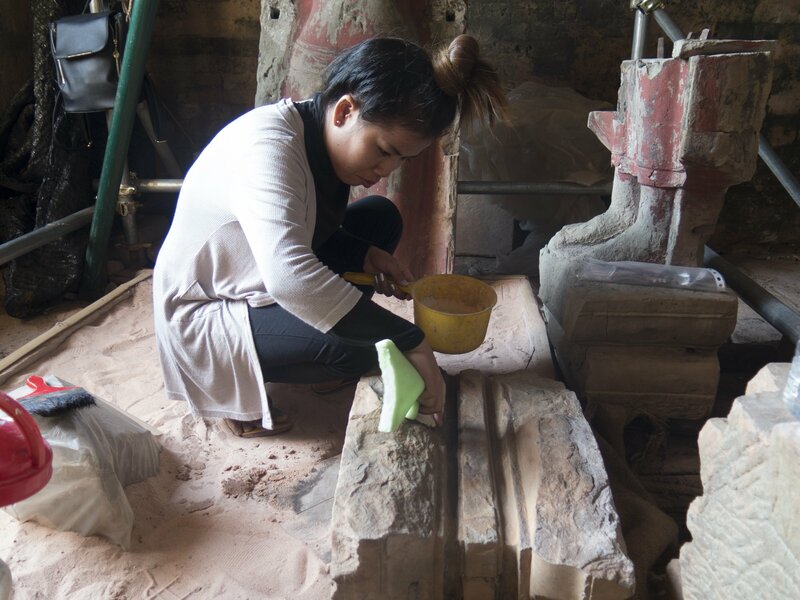 This year, the SCU celebrates 10 complete years of existence and, at the same time, it has been 5 years since the start of the vocational training scheme and the creation of a new generation of Cambodian stone conservators. During this time, the project evolved greatly and we are currently making arrangements for this occasion to be celebrated duly later this year. 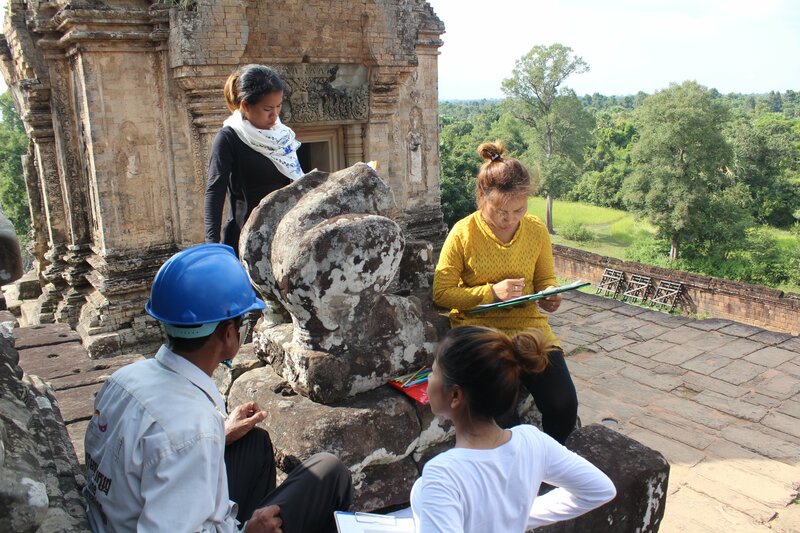 Apart from receiving specialised training in laboratory science and other relevant topics, the SCU is currently engaged in conservation and restoration projects at Prasat Pre Rup and Prasat Banteay Samre. The main focus being the conservation of ornamented surfaces like lintels and pediments besides figurative works embedded in the architectural structure like lion statues and naga balustrades. However, amongst these engagements is also a high profile project conserving two late 12th-century Buddha statues of the Bayon style within a coordinated multidisciplinary conservation framework, reflecting the significance and complexity of the subject and materials involved as well as setting new standards for future intervention approach models in Angkor.